Fund My Trip To Singapore Please - Go “MAD” with Joe Madureira at STGCC 2013! You know that time when the work of one single artist inspired you to start a collection? Yeah, that one piece of art or stuff that you loved so much that you had to start a huge collection. The artist that made me love collecting comic books is Joe Madureira. His awesome work on the Onslaught Marvel Crossover Arc made me collect comic books the moment I can afford them on a regular basis. It opened up a whole new world for me as a kid growing up. Not to mention that I learned to read more than any other kid in my group. I also learned how important it is to take care of your collection. Anyways, enough of that drama. All you really need to know is Joe Madureira will be coming over to the Singapore Toy, Game and Comic Convention 2013 to meet all his fans here on our side of the world. Now I'm kicking myself in the gonads because I don't think I can afford a trip to Singapore this year because of some "investments" I made. I'm hoping someone out there is kind enough to fund my trip this year and let me meet the hero who started my geek life. Not to mention have hime sign some of the comic books in my collection. For now just go ahead and check the official PR after the break. Go “MAD” with Joe Madureira at STGCC 2013! 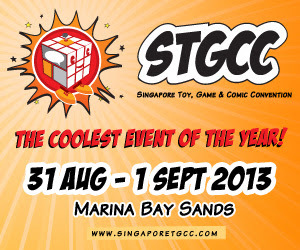 Singapore, 10 July 2013 – Come September, Joe Madureira will make his first appearance in Singapore at the highly-anticipated Singapore Toy, Game and Comic Convention (STGCC) 2013. Marvel Comics book writer/artist and game developer, he is acclaimed for his works on Marvel Comics’ Uncanny X-Men and his creator-owned comic book Battle Chasers. Affectionately known as Joe MAD among his fans, he will be here in Singapore for the first time at STGCC. He will be joining the Walk of Fame to get up-close and personal with his fans, bringing along some surprises as well. Exclusively for fans only!